Over Independence Day weekend we went camping in Crater Lake. When we checked in, next to the Pacific Crest Trail hiking box I had to Instagram in Wild homage, they handed us a pamphlet on the park. I unfolded its accordion creases to reveal the lake map framed in photos of wildflowers and mountain chickadees. 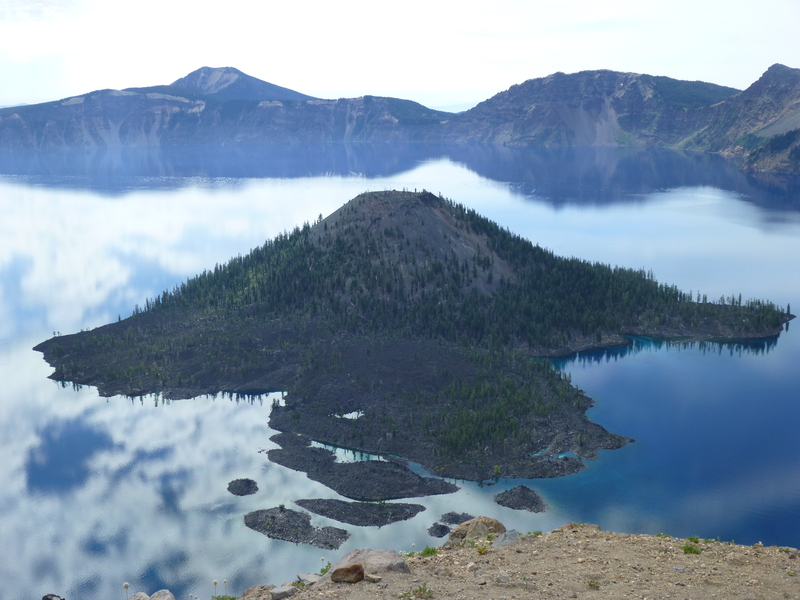 The beauty of Crater Lake belies its violent history, the footnotes warned. The deepest lake in America was, up until 7,700 years ago, a mountain. Mount Mazama, a Cascade Mountain volcano no different than Mt. Rainier, the backdrop for most of my life. The eruption, forty times stronger than Mt. St. Helen’s rumble in the 80’s, caused the mountain to collapse upon itself. Most of it was swallowed up by the lava core, a deep molten heart that beats on at this moment. Eight thousand years after the Klamath Tribe witnessed their god of sky and god of underworld battle on this land, we pull into the 22nd camping spot in Loop E. My husband takes the tent out from the back and puzzles out the canvas in the grass. I sort through bags of marshmallows and potato chips. I don’t think about how small we are because it doesn’t occur to me until right now, and there is only so much grandeur you can take at once: in the majesty of the earth, in the vastness of time, in the way you can’t exist in nature without being the worst part of it. Growing up in the foothills of Mt. Rainier, disaster was built into the curriculum. Our school was built on the backs of sleeping giants. We were shadowed by a dormant volcano, last seen sputtering in the 1800s. Our feet pattered across the Cascadia Subduction Zone, the tectonic plates that, at any moment, could create or consume our landscape. We practiced tucking under our tiny desks, covering our heads with our hands and tucking into our knees. Hold onto a leg of your desk, don’t let it slide away from you. Watch out for falling books. If you’re standing up, find a doorway and brace against it. Doorways are the safest part of a building. One afternoon in 10th grade, the ground rippled. We were changing out of our PE clothes, and I watched the bank of lockers rise and fall like buoys on the Sound. I braced myself against the doorway, but all my classmates mowed me down, screaming and running outside into the field. Doorways aren’t the safest place in a building when there’s a stampede. When I read The New Yorker article on the Pacific Northwest’s impending doom, I was on my way back from my parent’s house. The same house I grew up in, the one I found smack in the middle of the mud flow zone on my 7th grade teacher’s disaster projection map. Oh yes, the lava would miss us. No Dante’s Peak pyrotechnics for us. Just an instantaneous tomb of unstoppable sediment and debris. Everything west of I-5 will be toast, I read while we drove down the southbound strand of freeway toward our own house bought on borrowed time. The house on the west side of the freeway by about half a mile. My husband wants to know what’s wrong while I clutch my knees, my head curling into my lap. I don’t have a desk leg. I cling to the door handle. Our house will slide off its foundation and plummet into itself, a Crater Lake of too many shoes and not enough foresight. If we can escape that, the tsunami wave will drown us in toxic chemicals and sewage. If we survive that, home will descend into a third world nightmare without water, roads, electricity or laws. Someone will shoot me for my last case of Dasani. It won’t matter; there will be 13,000 Oregon and Washington corpses to keep me company. “We’re all going to die,” I try to explain. At Crater Lake, on the 4th of July, I attended the evening ranger talk at the campground amphitheater. This was my favorite part of camping as a kid; it’s where I got to sing the Banana Slug Song and make s’mores. Tonight we were discussing the effects of climate change on the park. The ranger began with the light stuff: antique photographs of Glacier National Park’s insurmountable swaths of ice, compared to shots taken last summer, of patches that would make it tough even to declare a Portland School District snow day. I gasped, because screaming would be impolite. The families around me kept chewing popcorn, plotting s’mores, rehearsing the Banana Slug Song. We need to stop…something. We need to do…something. “We’re installing solar panels!” the ranger bragged. This is all a treatise to narcissism, as good-natured as my strand may be. My inability to accept myself into an existential void of the greater universe is the hallmark of our generation. If I’m aware, my mind wants to believe, then I can change it. I can move to the other side of the freeway. Strap down the refrigerator. Buy the One-Month Survival Bucket from Costco (why does it need to ship “in discrete packaging”? Are the scavengers already afoot?). All day today, as the Reddit threads and Salon thinkpieces blossom tearing the original article’s science and sensationalism apart, I feel my bones crack. Phantom limbs of the future. When I am in the middle of something mundane, like refilling my water bottle in the office or sitting down to watch Chopped on TV, I wonder: is this it? Will I feel the wave crest beneath my flip flops, roll under the coffee table, curse Costco and their slow bucket shipping? Maybe the earthquake won’t happen in my lifetime. Maybe it will stretch into some future generation’s problem. This is the way we think, this is why we’re in all these messes. I do the math, count the years I have left. I do this with everything; the potential man-ushered ice age. The last bees. The sixth mass extinction. What calamity can I narrowly escape before the same inevitable death arrives in a tidier, quieter package? You carry the world on your shoulders, I hear. It’s not because I want to. It’s because it’s all I know. I am writing of a temporary affliction. By the time this posts, being an Oregonian freaked out by the New Yorker article will be as stale as last night’s Blue Star Donuts. This article will be filed in my head. Like the mud flow map and the glaciers, I’ll forget to be afraid. My insurance agent will neglect to call me back to answer my vague questions on foundations and coverage. I won’t mistake the creak of my cat walking across the floor for a buckle in the earth’s crust. I will live because I am that small, as small as anyone, despite any other delusions. We keep singing the banana slug song because it’s the only way to stay sane.